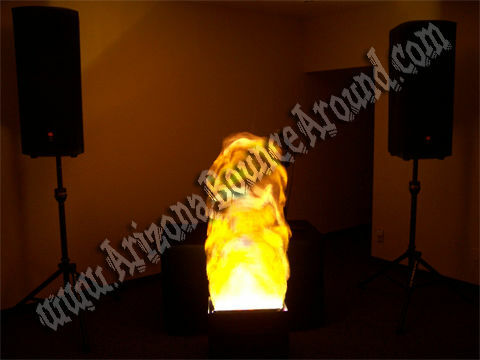 The large fake flame provides the illusion of having a large flame going freely on the floor. The fake flame is an illusion that also provides great accent lighting. The bright lights used to light up this free flying flame can help accent up your event. Perfect for entryways and works indoors or out. Check out the Large Fake Flame Video. Rent a 4' table with black full length table jacket for an additional $17.95 shown on top photo. Rent DJ lights in Denver, Colorado Springs, Aurora, Fort Collins CO from Gravity Play Events today.